Now Foods L-Tyrosine is a diet supplement for people who take care of the physical and mental condition of the organism. One capsule of this formulation contains 500 mg of L-tyrosine of pharmaceutical quality. This supplement supports the regeneration process, ensuring, among others, healthy and peaceful sleep. It has a beneficial influence on the nervous system and concentration. It positively affects the thyroid functioning, which increases the activity of energy pathways of the organism and helps to eliminate the level of fat tissue. Tyrosine, or more specifically, its L type stereoisomer belongs to one of the 22 amino acids building our muscular peptides. It can be produced from another amino acid, namely from phenylalanine, or be supported from outside along with food (it can be found in meat, eggs, milk, legume seeds). Tyrosine is involved in the formation of noradrenaline and dopamine. They are neurotransmitters necessary for the proper functioning of the nervous system and muscles. Noradrenaline ensures the mobilization of the organism to function. It accelerates heart rate, releases stored glucose and increases blood flow to the muscles. However, in the brain it stimulates concentration, increases arousal and facilitates memorizing. In the case of dopamine, the most beneficial is its effect on the brain characterized by increased motivation and improved functioning of the reward system. It strengthens cognitive processes, such as learning as well as sexual activity of the organism. Proper levels of noradrenaline and dopamine also reduce the risk of depression. Tyrosine can influence the proper functioning of the thyroid by participating in the synthesis of thyroxine – a hormone necessary to maintain proper metabolism. In this way, it contributes, among others to increasing energy, accelerating fat burning, facilitating concentration, increasing protein synthesis and decreasing cholesterol. Proper thyroid work also helps to improve the condition of the skin, hair and nails, and promotes good well-being. A deficiency of tyrosine can lead to hypothyroidism, which results in fatigue, drowsiness or a decrease in metabolism. Tyrosine is a melanin precursor, a skin pigment that protects against the harmful influence of UV radiation. Melanin is formed under the influence of tyrosinase enzyme, which is driven by sunlight emitting ultraviolet light. Thanks to this process in the summer, we can enjoy a beautiful tan. In addition, tyrosine supports the synthesis of collagen, which slows down the aging process of the skin. This is an important advantage of taking L-tyrosine in the case of people who want to lose excess kilograms. By affecting the noradrenergic and dopaminergic transmission, a feeling of satiety increases. Decreased appetite results in easier reduction of consumed calories, and thus – fat tissue burning. To sum up, Now Foods L-Tyrosine is a diet supplement with versatile effects. It has a beneficial influence on the nervous system and metabolism. It improves concentration, increases physical activity, ensures peaceful sleep and regeneration. Each person, regardless of work type – mental or physical, or if constantly under stress or trains hard, can feel the beneficial effects of using this formulation. 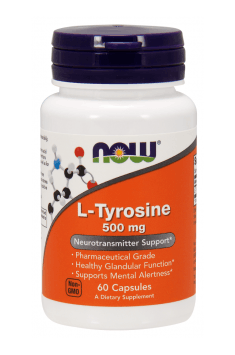 L-Tyrosine 500mg 500mg 60 caps. Take 1 capsule 1-3 times daily, preferably between meals. The beneficial effect can be accomplished by taking 0.5 to 2g (1-4 capsules) of L-tyrosine 30-60 minutes before the stressful factor (including physical activity). In case of using higher doses and observing side effects (e.g. stomach problems), it is recommended to divide the dose into 2 portions and take the first 60 minutes before the stressful situation and the second 30 minutes before. One should be careful in case of using monoamine oxidase inhibitors (MAOI) and L-dopa as well as when one has hyperthyroidism problems. Due to the fact that L-tyrosine is a precursor of stimulatory neurotransmitters, it can interact with drugs and dietary supplements with similar effects. Micronutrients with the addition of carotenoids, supporting the liver, eyes and cardiovascular system health. A large dose of aliphatic alcohols derived from sugar cane. Support for work of the circulatory system.